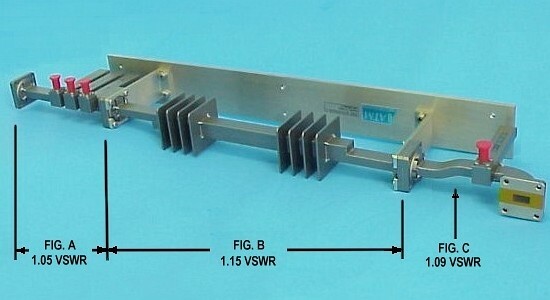 The VSWR Calculator uses the Root-Sum-of-Squares (RSS) Analysis to calculate the most probable VSWR values in a single waveguide assembly with multiple bends, twists, or a chain of Waveguide Assemblies when added together. To use the calculator, enter the VSWR value for each of the assembly components being added. 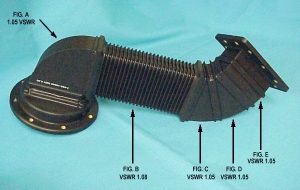 Enter VSWR of up to 8 components. If you have less than 8 components, leave the unused inputs as 1.0. If you need further assistance please scroll down for more detailed instructions for how to use the VSWR Calculator. To use the calculator, enter the VSWR value for each of the assembly components being added, as exampled below.